Antique Silver 4-way 24" chain/Carded"
Our 1 3/8" x 1" Antique Silver 4-way 24" chain/Carded" features our money-back guarantee. 1" Sterling Silver Miraculous Medal Made in the USA. The Sweeping Baroque Border is Adorned with finely detailed Blessed Mother Mary with rays coming out of her extended hands. The Reverse Side of the Medal Portrays an "M" with a Cross on the top and the "Sacred Hearts" underneath surrounded by Twelve Stars. This Sterling Silver Scapular and Miraculous Medal Combination with 18" Chain and Box is made in the USA. 7/8" Sterling Silver Portrayal of St. Nicholas in Bishops Clothing holding a Book. He is the Patron Saint of Dock Workers, Sailors, Fisherman. 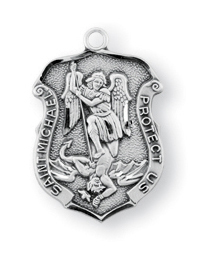 This Sterling Silver Round Shaped St. Nicholas Medal is made in the USA. Get 25 pieces for one low bulk price with our 25-Pack of Beautiful Hands Of A Priest Holy Card. Only available in this bulk pack. The Beautiful Hands of A Priest Clear, laminated Italian holy cards with Gold Accents. Features World Famous Fratelli-Bonella Artwork. 2.5'' x 4.5'' 25 Per Pack.